It's Wrestlemania weekend in New Orleans, and despite the Athletic Commission making some strange stances, there is a lot of shows to talk about. 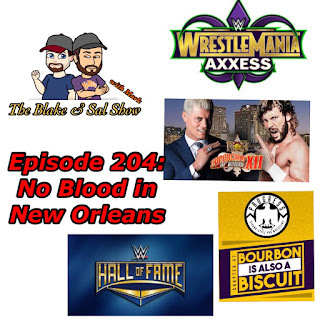 Blake and Mark bring in Rich Fann from the PW Torch to discuss every show at WWE Axxess, WrestleCon, Beyond Wrestling, Impact Wrestling vs. Lucha Underground, Progress Wrestling, Evolve and more. Plus Bruce Mitchell from PW Torch is here to help preview the WWE Hall of Fame Class of 2018 and Haydn Gleed from ProWrestling.net stopped in to help preview ROH Supercard of Honor XII. It's a jammed back show. Tomorrow morning Blake, Mark and Sal will preview NXT Takeover: New Orleans and of course WWE Wrestlemania.